Mumbai: A major fire that broke out on merchant vessel MV Amsterdam Bridge off the coast of Mumbai on Sunday afternoon, has been contained. The Coastguard took over six hours to control the fire, and now the cooling process is underway. "The flames have been contained but not extinguished. A thick plume of smoke continues to emanate from the vessel and fire-fighting as well as cooling operations are on," officials said. The 54,405 ton vessel is carrying chemical cargo which is hazardous and noxious in nature; if released into marine environment, it will have detrimental effect on human and marine life. "It is learnt that 24 containers out of the 112 on board the vessel contained 45 tonnes of dangerous cargo," officials said. The officials added that they have not witnessed any oil spill so far even though the ship fuel tank contained 2,600 tonnes of heavy fuel. The cause of the blaze is not yet known but the actual seat of the fire has been localised in hold number three of the vessel, they said. The Coast Guard received the first SOS call at 5.15 pm yesterday from the captain of the Antigua and Barbuda-flagged cargo vessel, following which two Coast Guard ships - Samudra Prahari and Subhadra Kumari Chouhan - were pressed into action. The crew was rescued immediately. However, when these two ships could not contain the fire, two more ships - Indian Coast Guard Ship (ICGS) Sankalp and ICGS Sangram - were roped in, along with an emergency towing vehicle. Officials suspect that the fire erupted somewhere near the engine room of the vessel. 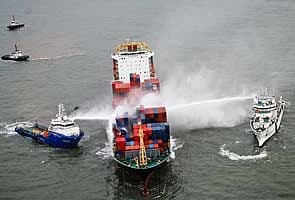 By late evening, the middle portion of the vessel had also caught fire. The vessel had reached the Jawaharlal Nehru Port Trust at the wee hours of September 8 and was en route to Sri Lanka. It was supposed to reach Colombo on Tuesday.